Bruce Barnbaum, and Ann Mason. Art Convergence, Juried Exhibition, Port Angeles Fine Art Center, Nov. 14-Jan 10, 2014. Collectibles, WallSpace Seattle, November 2008. Autumn Silks, Artisans On Taylor, Port Townsend, WA, Nov. 1-Dec. 30, 2008. Bird Studies, Photographic Center Northwest, Curator Ann Pallesen, Oct. 3-31, 2008. Yosemite Renaissance xxiii, Yosemite Museum Gallery & others, March-Dec. 2008. Strait Art 2008, Port Angeles Fine Art Center, special showing of Prayer Wheel for the Earth. Nature Observed, Museum of Ventura County, Group Show, May 26-September 3, 2007. Home is Where The Heart Is, Port Angeles Fine Art Center, March-April 2007, Featured Artist. Group Show, Ordover Gallery, San Diego Natural History Museum, Nov. 18-Jan 7, 2007. Selected Images, Ansel Adams Gallery, Yosemite Valley, continuing. Water As Inspiration, The Mumm/Ansel Adams Gallery, Group Show, Summer, 2005. Of Havens, Ansel Adams Gallery at The Mono Inn, Solo Show, June-July, 2005. Change Me To A Winged Bird, Blackberry Forest Gallery, Solo Show, Sequim, WA, 2004. Pentimento, The Buzz Gallery, Solo Show, Sequim, WA, July 2003. From Pixel to Photograph-The Art of the Digital Image, John Nichols Gallery, Ventura, CA 2003. Northwest Exhibition Of Environmental Photography, (Honors Award), Rainier Square, 2001. From Tornadoes To Tractors: Photographers Of The Rural Landscape, Whatcom County Mus. 1999. Strait Art Invitational, Port Angeles Fine Art Center, Pt. Angeles, WA 1996-1998. The Land, Invitational, Tacoma Art Museum, 1995. Selections, Eye Gallery, San Francisco, 1994, Curator-Linda Connor. Contemplating Eternity, Solo Show, Northlight Gallery, Pt. Angeles, WA 1993. Song Of The Raven Descending, Solo Show, Gallery Of Eastern Washington University, 1992. True Stories: Pleas & Thank Yous, Invitational, (Work On Tin), National Touring Exhibition, 1991. Images In Black And White, Coconino Center For The Arts, Coconino, AZ, 1990, Curator-James Alinder. Nadine Blacklock Nature Photography Fellowship for Women, 2006. Ansel Adams: Ink on Paper--A Guide to Digital B&W Printmaking, Sept. 2008, Assistant. 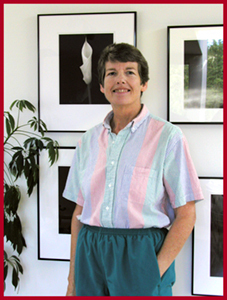 “Charlotte Watts—Photographer”, biography for Ansel Adams web site, 2005. “On Collecting Art”, Peninsula Daily News, Port Angeles, WA, Feb.2006. As If We Had Never Fallen, 2007. Feathers Coming Up Through Snow, 1993. The Sound Of One: Images Of The Salton Trough, 1990. PAFAC, annual fund raiser, Clallam County, 2007. Streamfest Auction, benefiting the North Olypmpic Land Trust, 2007, 2008. Artist Trust Benefit Art Auction, Seattle, WA, 2002, 2004, 2006, 2008. Juan de Fuca Festival of the Arts, 2006.